Myrtle Veronica Motte Snyder Boekhout was my daddy’s sister. She was born in November 1900 and died in March 1984. She was quite a personality. She is why I have been a musician most of my life. Aunt Myrtle played for silent movies, she told me many years ago. Last year I asked her son Bill Snyder if it was true. “Yes,” he said, “she played for the silent movies, probably in New Orleans in the 19-teens.” I wondered where in New Orleans that might have been but Bill didn’t know. Since then I’ve found that probably Myrtle played for the silent movies right here in Florence. She was too young when her family moved permanently back to South Carolina (her father’s home state) to have played for New Orleans movies. But Florence had quite a few theaters in the 19-teens and Myrtle was the right age to have put her musical talent to good use here. 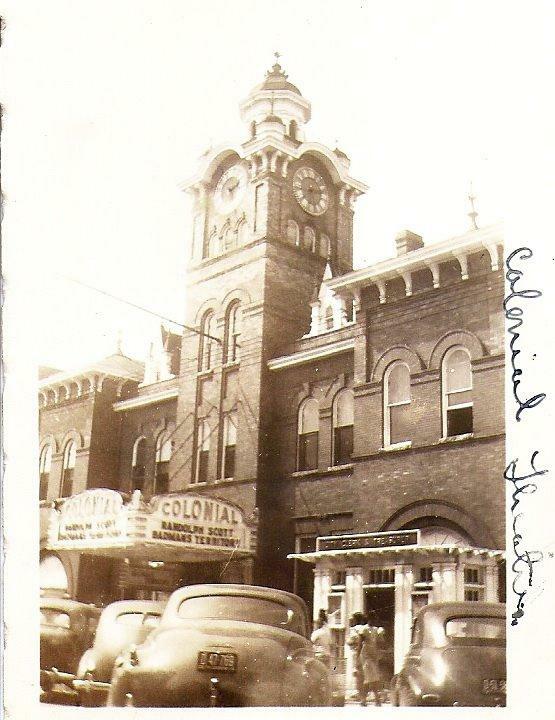 For quite a while, the Colonial Theater served as a combination Opera House (live performances) and movie house (first for silent movies, later for “talkies”). I was curious about how the music and silent movies worked. Did the film companies provide the music to the theaters? Did they only send a list of pieces to be played, along with the frames they went with? You know, fast giddy-up stuff for the western chase scenes, slow dreamy-romances for the love scenes? Or did the theater manager pick the pieces? Or hire a musician and then let her pick? You know, it’s hard to get that sort of information today. I am grateful to the internet for the answers to that question, and now I understand Aunt Myrtle’s stacks of stuff. She had reams and boxes and folders of piano music in her apartment on West Evans Street. Atop the piano and the dining room table were stacks of music. Underneath the popular sheet music were books of classical music; everything she’d ever needed for the films was still there at her fingertips. She entertained us with great rolling renditions whenever we visited her. In smaller cities the theater might only have an organ, perhaps calliope-style. The organist in some cities rose out of the floor on an elevator. This was a full-time paid position. The organist might receive the score with the film, or if the film company only provided a suggested list the theater manager (if he was generous) or the organist (if he wasn’t) would go out and buy the music. In smaller towns like Florence there was only a piano. The film came with a suggested music list and the pianist provided her own music. She watched the film as many times as it took to decide what pieces to use where. It must have been a lot of work. I never did learn how the pianist was paid. Was it by the showing? By the movie? By the difficulty? Was she reimbursed for the music she bought? I have no idea and I don’t know who to ask. Now, this wasn’t Aunt Myrtle’s only occupation. 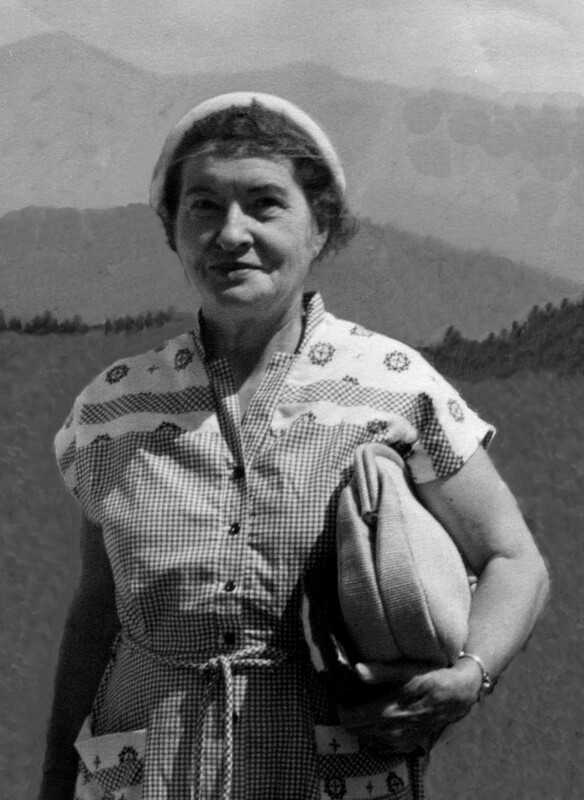 She was a ladies millinery specialist who worked for some time in a Richmond, Virginia department store. She knew all about ladies hats and she never went anywhere without one herself. Aunt Myrtle lived here in Florence when I was a child, but she didn’t insist I learn all about ladies hats — no, she wanted me to learn how to play the piano. So I did. Chopin, Bach, Beethoven, Handel, Tchaikovsky, big band numbers, movie themes and church music — if she loved it, she knew I would too. At the age of six I began taking lessons from Myrtie Berry Wescott, and for ten years I went twice a week during the school year. I learned how to read music, play scales, do finger exercises, and memorize long concertos. I worked hard, determined to play like Aunt Myrtle. Long, trilling runs up and down the keyboard were her trademark. Fast or slow, soft or loud, crashing major chords or eerie minor ones, octaves and arpeggios galore. Somehow, however, these beautiful runs escaped me. A glitch in my finger joints has interfered, so I don’t play exactly like Myrtle. But I do play, and I love to play, and that is her doing. 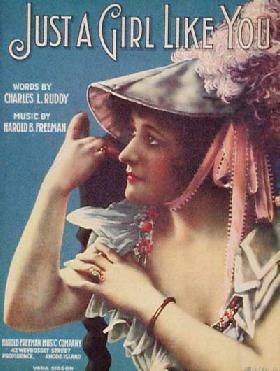 I was born several generations too late, but I wish I could have attended a silent movie with Myrtle at the keyboard. That would have been a blast! Remember “Strains of Music” in the 300 block of West Evans Street? In the late 1950’s Hal Strain owned and operated this popular music store in downtown Florence, offering a variety of instruments for music students and band members. My own interest started and stopped at a set of vertical stands in the main room of the old house; sheet music. Spring time always brings back sometimes pleasant, sometimes unsettling memories of music recitals, marking the end of one musical academic year and the beginning of summer vacation. Independence from scales, finger exercises and the classics was granted in the summer. That’s when we made occasional forays to Strains for popular sheet music. My piano teacher Mrs. Myrtie Berry Westcott didn’t allow such things inside her piano studio. No popular pieces, no folk music or even hymns were permitted to be played there, nothing but Standard instruction books with the works of Chopin, Beethoven, Strauss, Mozart – you get the idea. Sometime in late winter we would select our recital pieces. I say “we” but really it was her selection. She would make a pretense of giving us piano pupils a choice but the choice was limited to two or three pieces in our grade range. I remember quite a few of those recitals, nerves and all. Pretty frilly dresses for the girls, dress slacks and shirts for the boys. Our recital hall seemed to change every year. One year it was the museum, one year Hodges Piano and Organ on North Coit Street, and one year the auditorium upstairs at the Library. No matter what the venue, the atmosphere was the same, stage fright and nervousness. Squirming in my seat as I waited my turn, I would use my knees as a makeshift keyboard and rehearse my own piece over and over. “Can’t you be still,” my mother would whisper. No, I couldn’t, I was terrified I would forget the whole thing. If I didn’t do well, then I might not get a shopping trip to Strains of Music! Somehow I always played well enough to earn a “well done” from Mrs. Westcott, a hug from my parents, and reassurance that my reward would be forthcoming. Sheet music! The summer months were a wonderful mix of play times. Some outdoor fun time was spent in Circle Park or Timrod Park and some was spent at Mimi and Da’s farm. But a great deal of fun time was spent indoors at the piano, picking out the melody of big band numbers from the movies or direct from The Hit Parade on television. For special treats mama brought home entire music books like Hits of the Forties or the Best of Guy Lombardo. It was easy to keep my fingers and brain limber during the summer months, I’d just turn on the radio, flip through pages to the appropriate piece, and follow along while listening to real musicians play the real thing. Strains of Music moved from Florence to Waynesville, North Carolina in 1961. Other music stores contained sheet music and music books of course, and over the years I’ve shopped in every one Florence had, I think. But the last time I went looking for sheet music was not in an actual store, it was on-line — nowadays you can simply plug in your credit card number and print your own pages right off your computer printer. It’s not the same, though. The paper is smaller and the musical notes are smaller. I’d rather push open the door with the jingly bell and smell the aroma of new guitars, band instruments, polishes and wax. I’d rather finger the metal racks and flip through the piano pieces, sniff that velvety, woodsy paper and visualize big bands playing those wonderful numbers. I could look at the bars of music on the page and hear the song in my head, despite the sounds of customers in the background thrumming the strings of a guitar or banjo. Some time ago my daughter brought me a little present, a very old piece of sheet music. “Kiss Me Good Night (Out the Window You Must Go).” I’d never heard of it before but the words are catchy and cute. Copyrighted in 1913, it was probably printed in the 1920’s. As I took the piece out of its protective plastic cover, she had no idea what a thoughtful gift it really was. That woodsy, velvety feel and smell of the paper took me right back to Strains of Music, like it was just yesterday.